SINGAPORE, March 12, 2018 /24-7PressRelease/ — Informa Life Sciences Exhibitions, the region’s leading healthcare exhibitions organiser, has announced that the MEDLAB Asia Pacific Exhibition & Congress will be returning to the Suntec Singapore Convention & Exhibition Centre in Singapore on 2 – 4 April 2018. Now in its fifth year, MEDLAB Asia Pacific will provide a platform for leading companies to showcase current technologies and clever innovations in the field of laboratory and diagnostics. MEDLAB Asia Pacific is co-located with Asia Health, a trade exhibition for medical equipment, products, services and technologies hosting more than 250 international companies across 6,500sqm of exhibition space, including 11 dedicated country pavilions including Austria, Belgium, China, France, Germany, Poland, South Korea, Spain, Switzerland, UK and USA. Both specialist trade shows combined bring over 4,000 medical laboratory and healthcare under one roof. Now firmly established as the region’s premier B2B business and educational platform for the medical laboratory industry, MEDLAB Asia Pacific continues to enjoy the support of a large number of key healthcare federations and associations across the region including The Royal College of Pathologists of Australasia, Singapore Society of Pathology, College of Pathologists, Academy of Medicine of Malaysia, Indonesian Association of Clinical Pathologist and Laboratory Medicine, Singapore Society of Haematology, College of American Pathologists, Philippine Society of Pathologists, Inc., Philippine Society of Biochemistry and Molecular Biology, Philippine Society of Microbiology, Indonesian Association of Clinical Chemistry, Society of Infectious Disease Singapore, and Society of Cytology Singapore and Diabetes Singapore. 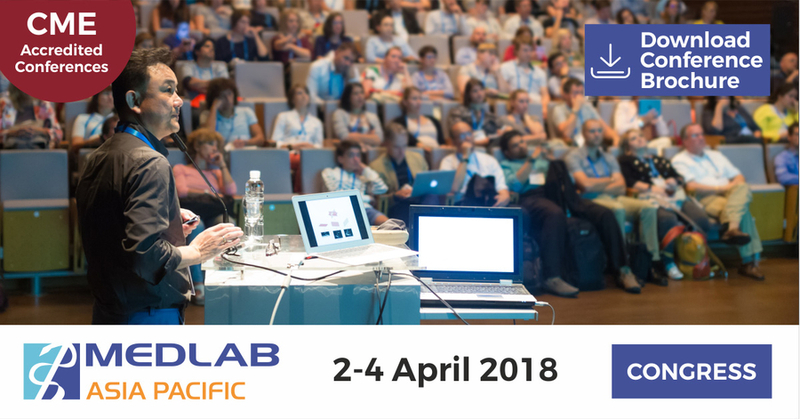 In line with Informa’s motto of “Exhibition with Education”, MEDLAB Asia Pacific Congress will feature a multi-track, fully accredited conference programme providing unparalleled education from more than 100 expert speakers offering management solutions to help labs excel. “Supported by The Academy of Medicine, Singapore and accredited by Singapore Medical Council, the congress offered 15 CME-accredited conferences covering a range of topics including Laboratory Management, Clinical Chemistry, Haematology & Blood Transfusion, Infectious Diseases, Point of Care Testing, Cytology, Molecular Diagnostics, Laboratory Informatics, Cardiac Markers, Lab Testing: Obs Gyne & Women’s Health, Lab Testing & Management: Diabetes, Obs Gyne & Women’s Health, Gynae-Oncology, Diabetes Management and Antimicrobial Resistance,” commented Coleman.